Servicing Anne Arundel County, Baltimore County, and more. 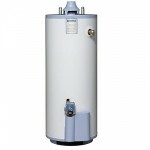 Why choose professional installation of your water heater? Never wait for warranty parts by mail. Did you know that most home improvement stores do not carry parts for water heater repairs? That means if anything goes wrong under the part warranty, your replacement part will be shipped by mail from the manufacturer. That could take severals days, which means you are out of hot water for at least that long. However, through our connections with supply houses, we can get 90% of replacement water heater parts the same day so you never have to wait to have hot water again! Guaranteed Quality Equipment. We’ve been installing water heaters for over 45 years. So we’ve had experience with a lot of brands and models, and we’ve selected brands that have been tested for their high standard of quality. Quality Testing, Safety Testing, and Operation Checks are always included. Installation is important for water heaters to prevent big headaches later. A professional installation means no worries about incorrectly connected gas lines, leaking carbon monoxide gas, or water leaks. Disposal of old water heater at no additional cost. Less hassle for our clients is always our goal. Personalized, expert advice so you can choose the optimum size and type for your family’s needs. Do you run out of hot water before you’re finished showering? Do you want your energy or utility costs lowered? Do you find that you have an unusually high amount of sediment and tank build up? Let us help you solve your water heater problems before you make a 10 year investment. We are happy to give you a FREE in-depth evaluation and estimate custom fit for your specific needs. Upfront pricing for our most poplar type and size water heaters. Energy saving operation, quality, and efficiency at an affordable price with superior protection tank lining. Longest lasting tank available. Ultimate leak protection, ideal for well water. Heavy duty insulation for minimal heat loss. For homes with conventional venting chimneys. Energy saving operation with superior protection tank lining. For homes with PVC Direct Power Venting. Excellent first hour performance, superior protection tank lining, and 5-10% more energy efficient than standard models. Endless supply of hot water and up to 40% less energy used. Every tankless water heater installation is different. Please call or contact us online to schedule your FREE estimate. We also offer larger size capacities, High Efficiency, and Energy Efficient options. Please call or contact us online for your free estimate! We also offer installation services for conversions, retro-fits, relocations, and new construction. However, since every installation is different, please call or contact us online to schedule your FREE estimate.